For some time now, I've wanted a "folding camera." These are vintage cameras, produced from the 1920s until the 1950s, that literally fold and unfold, with the lens attached to a leather bellows that retracts inside of the camera when not in use. They were the compact of the era, a camera small enough to fit into a bag or a large pocket, or wear around your neck. Most such cameras are medium format, taking 120 roll film. Not long ago, after lots of eBay hunting, I found the camera for me: a Mamiya Six KII, first produced in 1956. 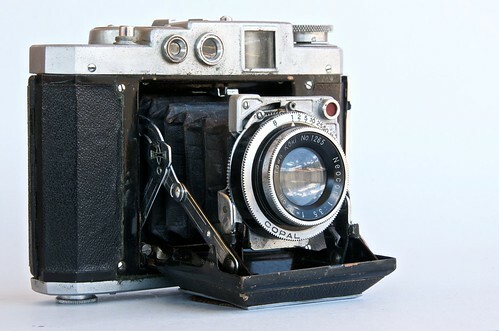 It's a 6x6 format camera with a coupled rangefinder (rare!) and the ability to shoot in 6x4.5, if you want more frames per roll. Now, these cameras—or specifically the lenses on these cameras—were made when color photography was still new. They are built for black and white, and lack the coatings that capture the full vibrancy of color film. They still render color, they just do so with a bit of character. Which brings us to these photos. This is the first roll I shot with the Mamiya. You'll notice that things are very sharp and clear—that's the lens, which is in good shape for its age. You'll notice that the colors are vibrant—that's the film, Kodak Ektar. And you might also notice a certain character to the photos. They are sharp and saturated, but they don't quite look modern. That is whatever magic happens when you use modern film with a 60-year-old lens. I'm a fan, and I can already see that this camera will get a lot of use. As for details re: these photos: I took the first four while observing a public art installation in D.C. I took the other eight while walking through Chino Hills State Park in Chino Hills, California.